Darrell Nettles’s paintings, gallery press materials say, “are ergodic in the deepest and most satisfying sense of the word.” Ergodic is a math/physics term indicating a system that operates over both time and space. Applied to the handsome, elegantly ordered letter-and-word pictures of Mr. Nettles (b. 1948), it seems to mean that the viewer is intended to appreciate them both spatially as paintings and sequentially, as texts to be read. In terms of the former, the artist does a fine—actually, a refined—job. “When You Look at Me” (2014), at 82 by 60 inches one of the two big paintings in the show, is as dignified as a diplomat’s three-piece suit. 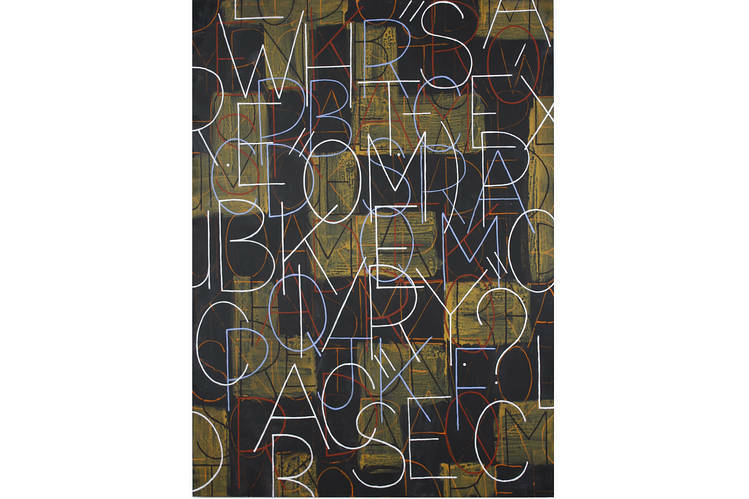 Two smaller near-abstractions with partial letter shapes incised in thick white or black paint are more vigorously arresting. The exhibition slumps a little in the midsize panels (about 3 feet high by 2 feet across) with sprayed-and-masked-off whole words. In them, the painting quotient is less, the poetry part greater. The poetry is conventionally abstruse, but not much more than that.